A flagpole (right) was installed Monday on the plaza outside the Barclays Center arena, near the intersection of Atlantic and Flatbush avenues. It's obviously meant to be a beacon of sorts. 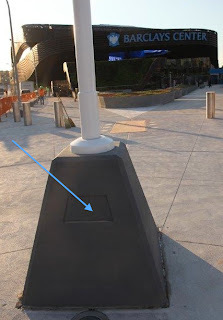 There's space on the flagpole base for a plaque (left). What's coming? There's no official announcement yet, but I hear that the flagpole is supposed to represent the flagpole at Ebbets Field, home of the baseball Dodgers until they left Brooklyn after the 1957 season. And that means the flag will either be vintage or a copy. It's another effort to link the Nets and the Dodgers, a connection important mainly to men of a certain age--like Borough President Marty Markowitz--and a connection easily grasped by media outlets. But Markowitz is the only one involved with this deal who seems to have an emotional attachment to the Brooklyn Dodgers. Barclays Center is not something meant to eradicate the ghosts of the past; it is a project entirely based on Brooklyn’s future. But there's still mileage to be gained from the past. 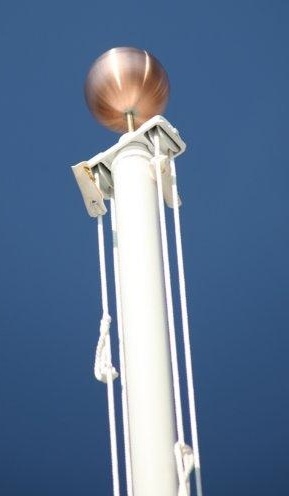 At right, a close-up view of the top of the flagpole. And here's a link to the photo of the flag at Ebbets, where the resemblance is hinted.